On December 14, 2012, 20-year-old Adam Lanza fatally shot twenty children and six adult staff members at Sandy Hook Elementary School in Newtown Connecticut. Prior to his deadly assault at the school, Adam Lanza had murdered his mother Nancy, at their home in Newtown. Thereafter, Lanza committed suicide, shooting himself in the head. On January 10, 2013, a 16 year old student opened fire with a 12 gauge shotgun at Taft Union High School in Kern County, California. Most recently, Christopher Jordan Dorner, 33, a former Los Angeles police officer who has violently threatened his former colleagues has shot at multiple officers early Thursday, February 7, 2013, killing one and injuring three others. This “rampage” by a disgruntled discharged officer sparked a huge manhunt in Southern California. Dorner is also accused of a double slaying on February 3, 2013, in Irvine, California, allegedly killing the daughter of a former LAPD officer who later became an attorney and once represented Dorner, and her fiancé. 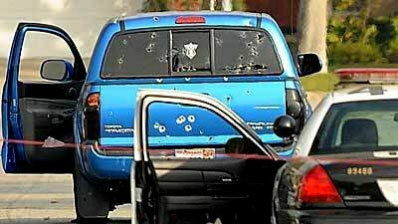 During manhunt by LAPD, officers mistakenly fired into a pickup truck which they erroneously believed was driven by Dorner, injuring two women delivering newspapers. The Law Offices of Gary C. Eto, located in Torrance, California, has been representing victims of gun violence for decades. In July of 1995, a disgruntled employee of the City of Los Angeles, Willie Woods, came to work and opened fire, targeting and killing four of his supervisors, Anthony Gain, Neil Carpenter, Jim Walton, and Marty Wakefield. Gary Eto successfully represented the four surviving spouses and obtained a $1.9 million dollar settlement. If you or a loved one has been injured or killed due to gun violence, contact the Law Offices of Gary C. Eto to see if you have a case.